There’s something slightly silly about being followed by your personal waiter to your breakfast table – him carrying your morning breakfast plate in his hands while walking directly behind you at the Grand Velas. As I sit, he takes my napkin and places it in my lap, asking me if there is anything else that I might need. Seriously, what else could I need? 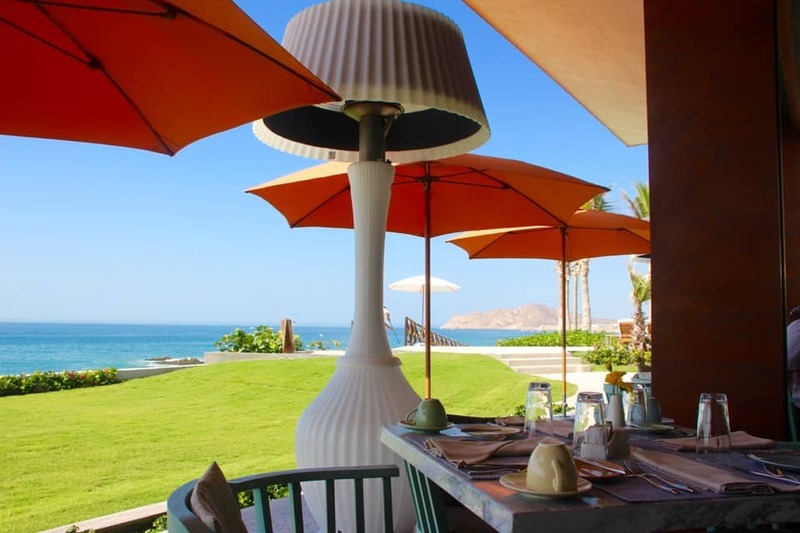 The all luxury Grand Velas Los Cabos – Sitting in the open-air Azul Cafe. I knew the minute I was going to Los Cabos that I wanted to stay here. As a luxury travel writer, I get the inside scoop on the luxury places that the luxury travel writers are buzzing about. And as they say, “This was one for the books.” I couldn’t wait to experience it for myself. Grand Velas opened as recently as November of 2016 and is the latest of the family-owned Grand Velas group of hotels in Mexico. What I didn’t expect when I arrived is that I was going to have almost the entire three hundred and four ocean view suite hotel to myself practically! I happened to be going to Los Cabos during the shoulder season in June. I was there for an Expedia Mexico Conference, where I was a panelist for the Grand Velas talking to about 100 hoteliers about how to work with digital influencers in the field of travel. Arriving in my suburban pickup from the airport, I couldn’t wait to jump out and run to my long-awaited, ocean view suite. But when you enter a place like this, you have to act calm, cool, and collective and not like you are jumping around and screaming inside with excitement about your stay. So that is what I did, I acted cool, even though I was a hot mess from the temperatures outside that were rising by the minute. Once it was articulated by the white-clad attendants that a new guest had arrived, they sent over a staff member for my personal check-in. In the meantime, her colleague brought over a welcome drink. And another attendant appeared with freshly moistened towels. The attendant then brought me over to the best view from the resort in the lobby, had me sit in a comfortable chair, and called another colleague who handled the upper floor suite stays. He was to be my personal butler for the rest of my stay. They even had a masseuse standing by for a neck and shoulder massage. My first sensation at the Grand Velas Los Cabos was the feeling of stress melting away! Having checked into so many fabulous hotels around the world, it’s sometimes hard to be truly wowed. I realize that this luxury hotel is all about meeting one’s desires, not necessarily their needs. These desires require that some sort of choice and definition are implied, which is why they foresee your every move. It seems that true luxury hotels these days are all about these defined choices and taking service to a whole new level. Grand Velas Los Cabos has made sure that all your choices and desires are known the moment you arrive. 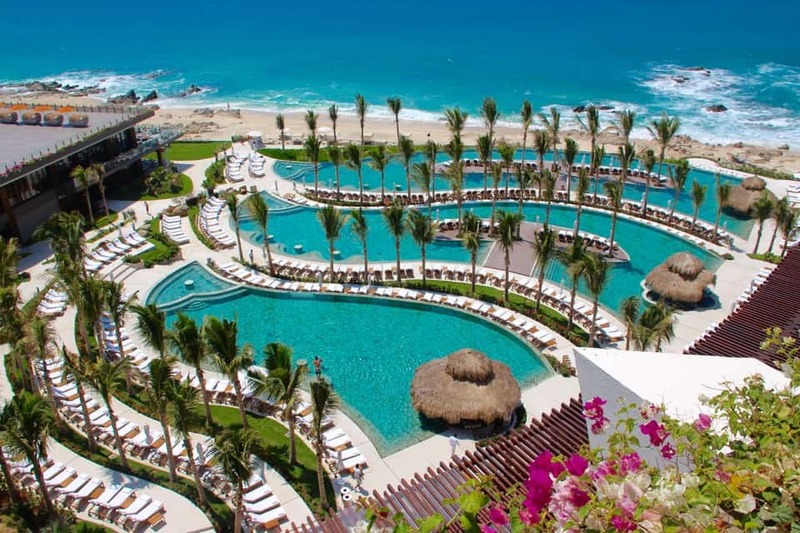 Grand Velas Los Cabos dwells in the world of mini-breaks! 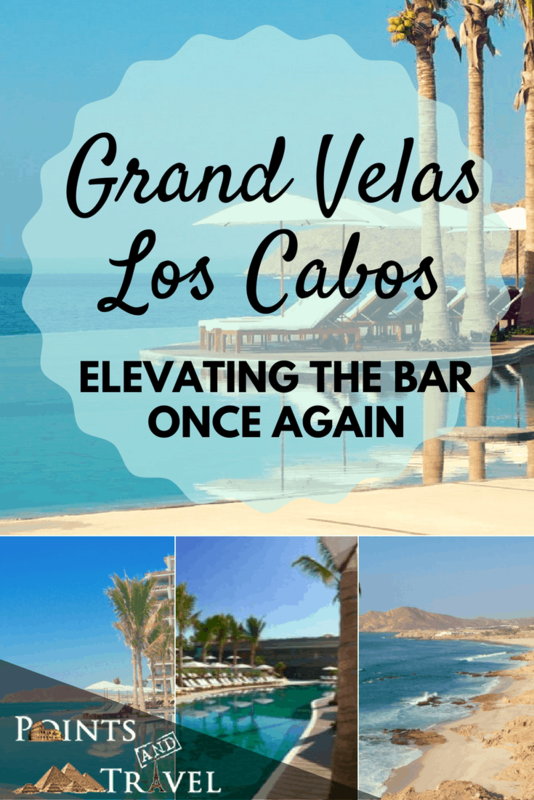 The Grand Velas Los Cabos has upped the game in the all-inclusive experience in the Los Cabos region to a whole new level. Just like my previous stay at the Grand Velas Riviera Maya, the all-inclusive‘s game has changed and has now met the upscale client’s needs. I do kinda like having everything handled, so you don’t feel nickel and dimed in luxury spa resorts. 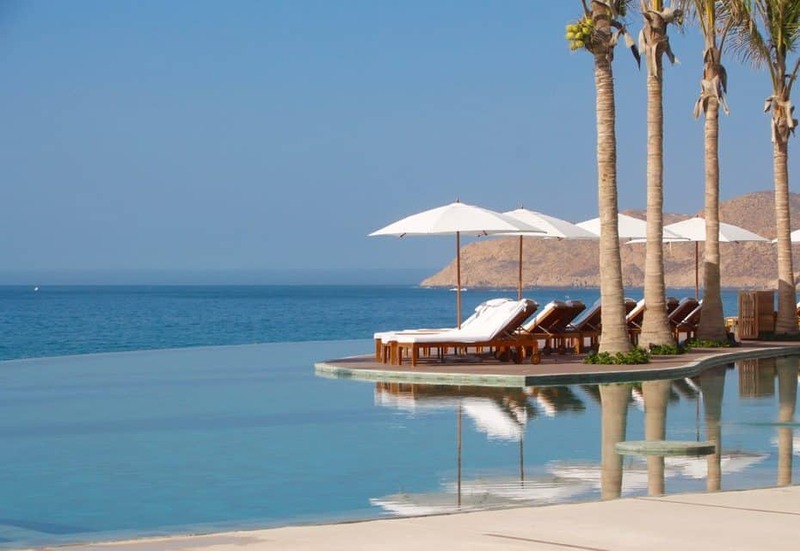 The Grand Velas Los Cabos is just one of the latest all-inclusive luxury resort to pop up in this not-so-sleepy Baja California town. 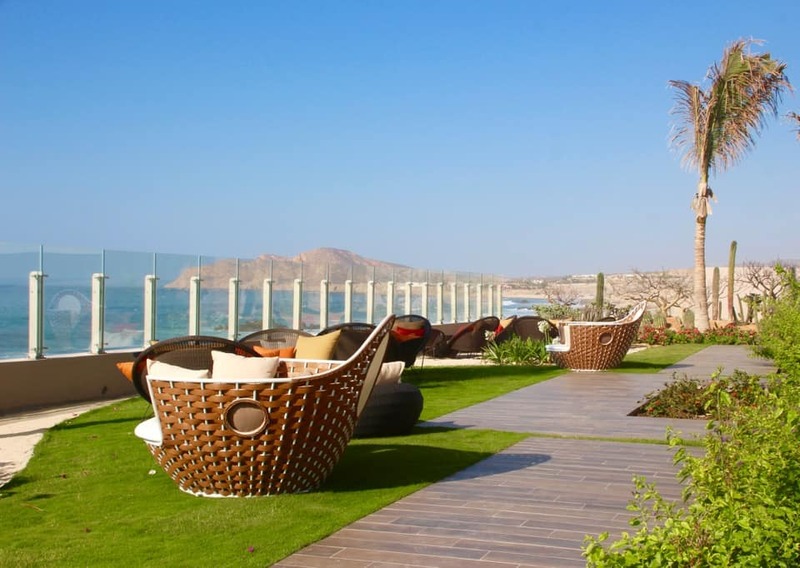 This particular brand is owned by the Velas family and is the fifth hotel in their collection. They built the Los Cabos location where you can see the layers of Azul blue ocean from the curved half moon space of the lobby. 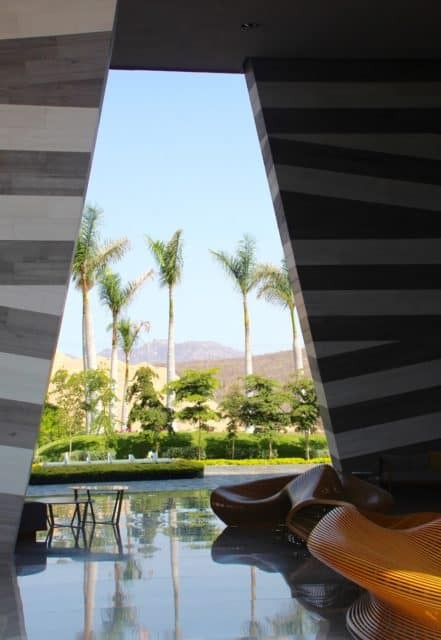 The architect, Roberto Elias, designed the hotel with the entrance as a focal point, where it has a soaring three-story entrance and a stunning view. Looking around the lobby, I could easily see that the $150 million they put into this place was well spent. The architecture alone is dreamy and creative, as Mr. Elias created the resort in the shape of a ship’s sails (which is one of the meanings of the word “Velas” in Spanish!). Where each room has an ocean view and offers privacy between each suite’s balcony. There is no peeking around to see what your neighbor is doing – pure privacy. 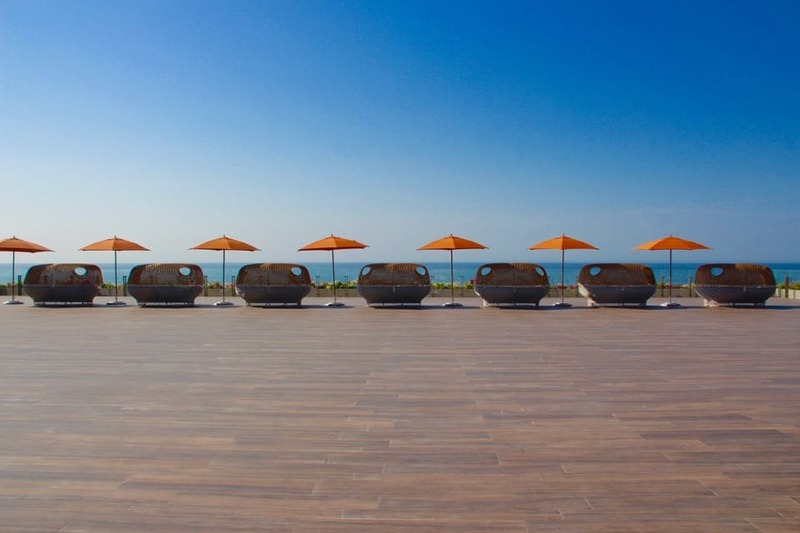 The Grand Velas has an upscale, modern Mexico feel. It is true, the magic truly does begin here. I stayed in suite #805, an Ambassador Class suite, which is on the eighth-floor and measures about 1,200 square feet. This includes a spacious outdoor balcony with a double-wide chaise facing the ocean. The king bed and pillows are what dreams are made from and are obviously high-end products. There is an abundance of electrical outlets near the bed on both sides (oh the joy!). The bathroom is huge, with a rain shower and a Jacuzzi tub. The mini bar is stocked full of goodies: Grand Velas labeled tequila, wine, Nespresso coffee, sodas, beer, water and fresh fruit all included and refreshed daily. Every suite includes a butler, who acts as your personal concierge throughout your stay. Literally, you could go on holiday here and never step out of your suite. But then again, you must go down to the pools, Oh, and the spa, and oh, and the restaurants! 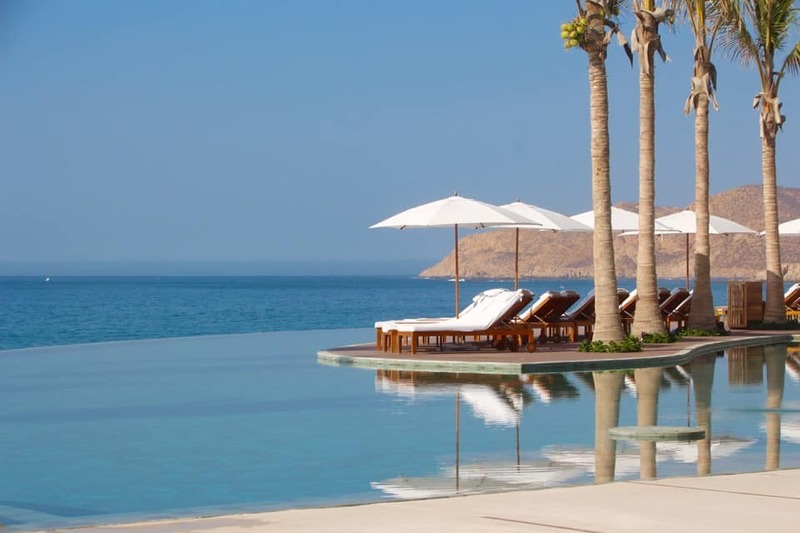 With its seductive infinity pool on the edge of Land’s End, it is nothing short of stunning. This was one of my favorite parts of the Grand Velas, the pools. There is not only one infinity pool, but several, all infinity pools that cascade down to the last one, each increasing with the coolness of the temperature of the water. There is also plenty of places to recline and setup lounging for the day, as this place is massive and has you covered as far as drinks, towels, and relaxation spots in the shade. The attendants are always nearby to bring you what you desire. You could also go down to the beach where there are cabanas set up in the sand. They give service out there too! 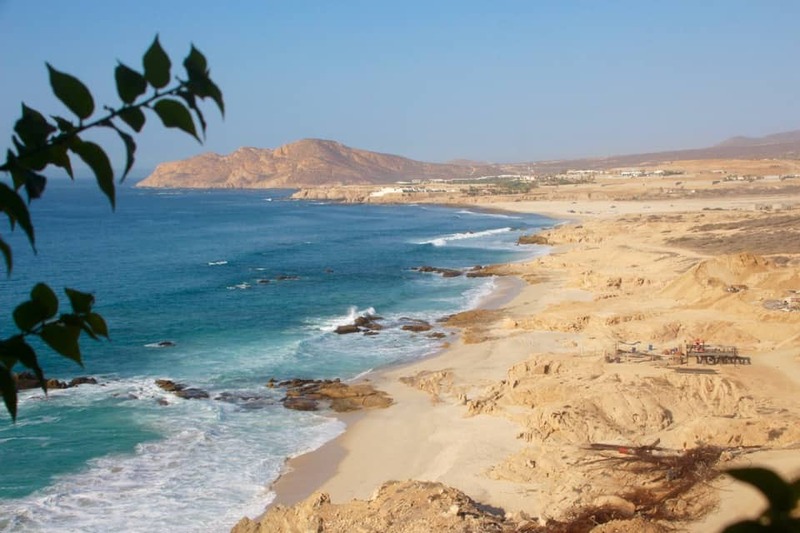 Just so you are aware, this is a no-swim beach, as the Sea of Cortez and the Atlantic Ocean converge at Land’s End and it is posted as a dangerous, black flag no ocean swimming area. 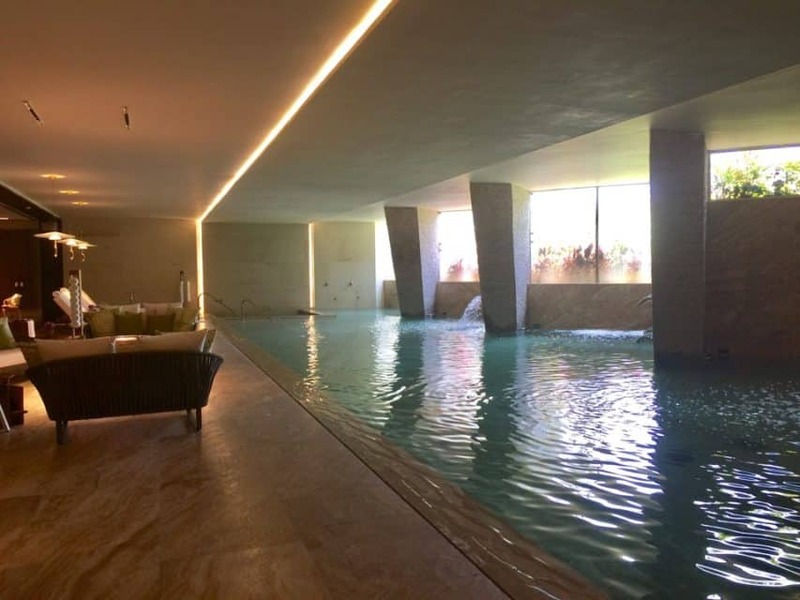 The spa treatments are one of the few extras at this hotel that are not included, but at the very least, you must experience the water journey of hydrotherapy pools. My husband and I both had luxurious massages and then met at the hydrotherapy lounge for a wonderful experience from hot to cold and from jets of every type and style. They have saunas, steam rooms, ice rooms, bubble beds, polar pools This is a “do not miss” portion of the experience at Grand Velas Los Cabos. 7 Upscale and Fine Dining Restaurants (plus a cafe) – You will never go hungry! Count them: Seven restaurants that all serve dinner; plus, a café that is open all day. The dinner places do require a reservation, but your concierge butler can take care of that. They are all casual-chic dress, as no one wears shorts or flip-flops to dinner, but instead, casual-elegant beach style is best. Keep this in mind as you pack for this trip. If you don’t feel like going downstairs for dinner, you can always order the included room service! 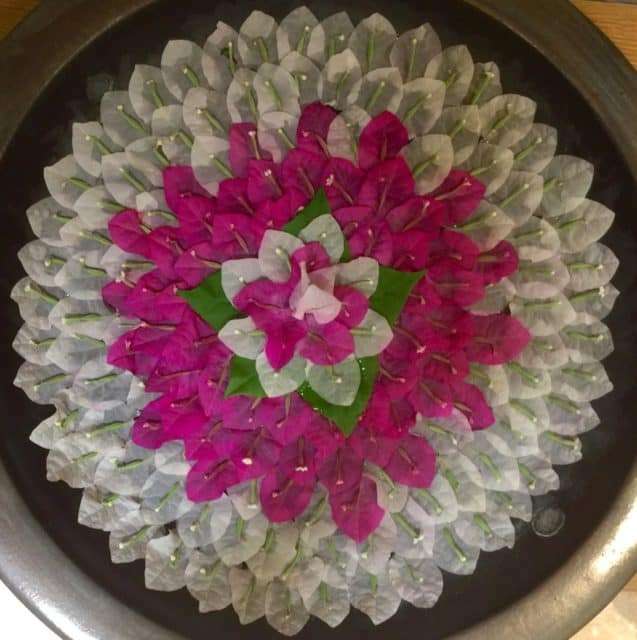 Cocina De Autor – Playful 10 Course Tasting Menu with a 2 Michelin Star Chef! Sky Bar, Miramar Bar, Koi, and the bar at Cocina de Autor. 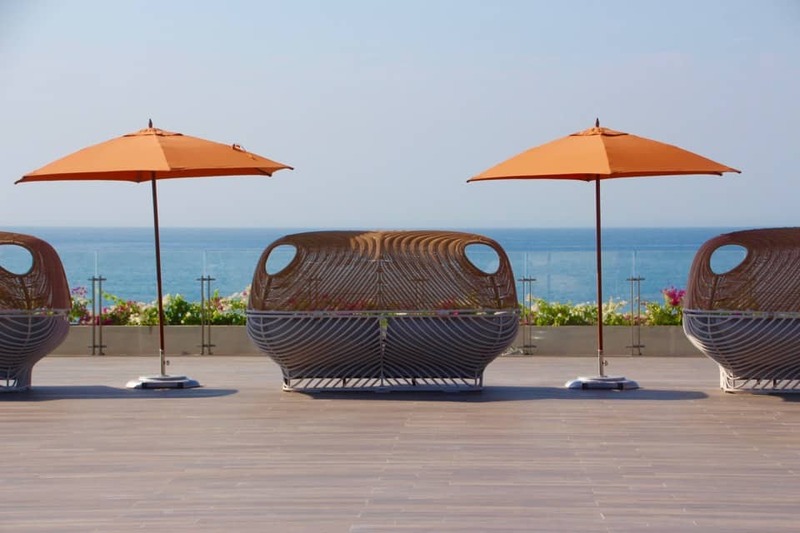 All bars and restaurants offer stunning views with both indoor and outdoor settings. But my favorite was the one at Cocina de Autor, where the collections of interior design aspects were quite interesting to antique camera and equipment buffs. Costs – Ok if you must know how much it will cost you! Roughly $750 per person per day. There are variations of this price and it can get as low as about $500 a day, so be on the lookout for a smart luxury deal! Think also about going during the shoulder season. Subscribe here to their email offers! 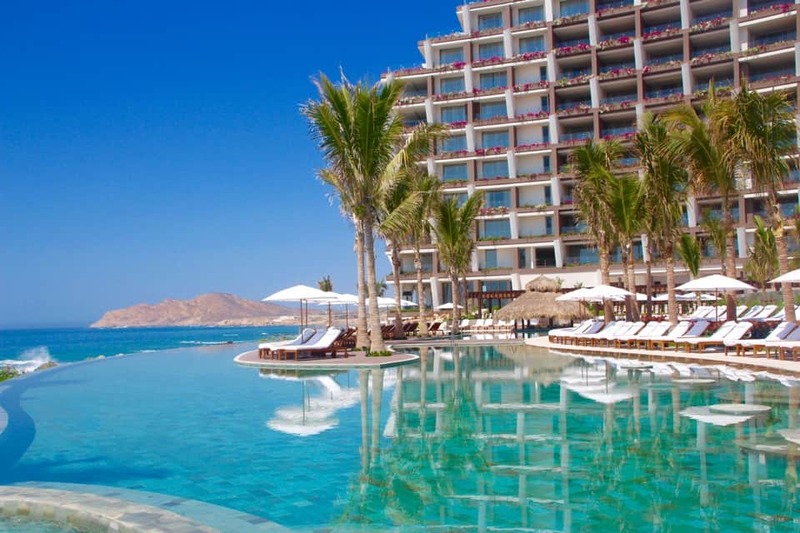 The Grand Velas Los Cabos is perched on a pristine stretch of private beach between Cabo San Lucas and San Jose del Cabo and is about a 30-minute drive from the Los Cabos International Airport. This is a kid friendly hotel. There is an amazing Kids Club, kid’s pool, and waterpark area. There is also a nanny service, so don’t even think of skipping a date night! Just realize this is not your typical resort with kids. So if there were kids there when I was, I can barely remember seeing them, much less hearing them, which is the way I like it! 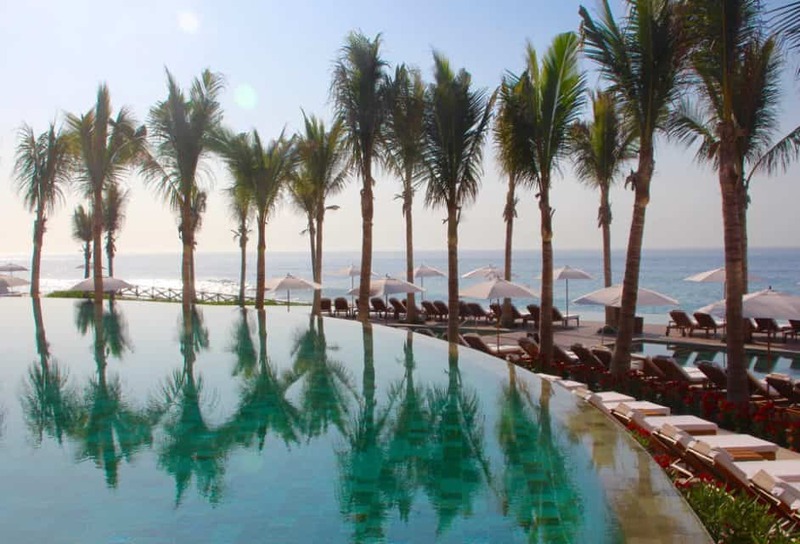 Grand Velas Resorts are located in the Riviera Maya, Puerto Vallarta, Riviera Nayarit, and Los Cabos. Combined they have earned more than 43 AAA Diamond Awards, including the prestigious Five Diamond Award. Disclosure: The writer believes in full disclosure and wanted to let you know that this trip was provided by the Grand Velas Los Cabos. As is common in the travel industry, the writer was provided with accommodations, meals, and other compensation. 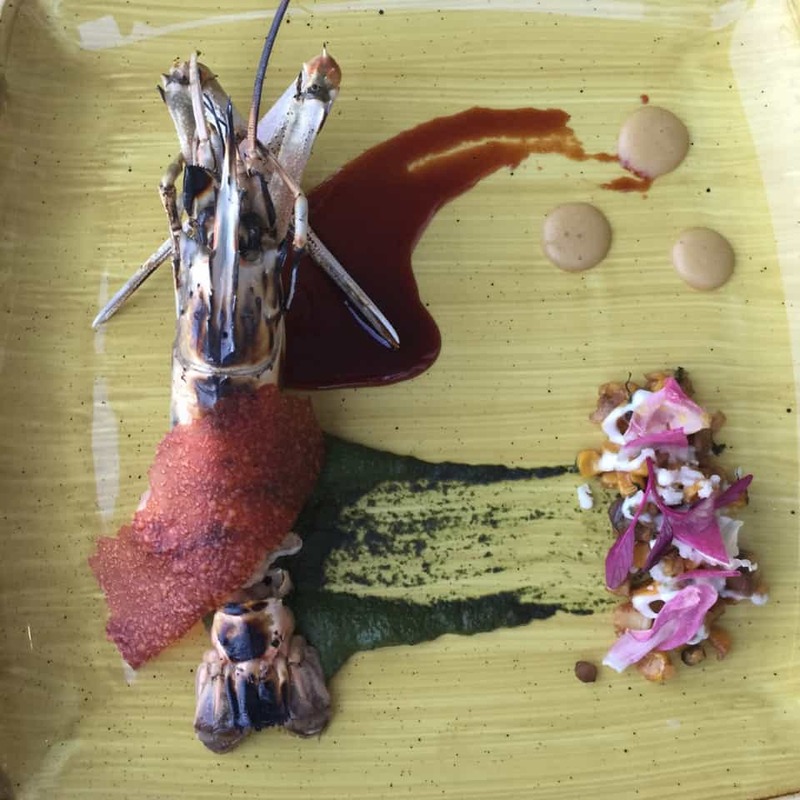 Xcaret Cancun: What is it? That looks like absolute paradise. I would LOVE to get there someday to see it for myself. Your photos are gorgeous. I can totally see why you were wow! This place is gorgeous. I’m always looking for places to travel to because I love to travel, I know I need to check this place out now. Yes, great idea! Plus no crowds! That water is so blue! We are going to Cabo in Aug. Your post got me more excited! Fantastic! Be sure and stop by or stay here! This is exactly how I picture paradise! My husband and I would love to go to a place like this. So awesome! Yes, the Grand Velas is Paradise! A few years ago, my husband and I stayed three weeks in Los Cabos. It was three weeks of heaven on earth. Your resort looks amazing and I’ll always remember how good the food was. WOW! three weeks! Awesome! And yes, the food in Cabo is good! Wow! they have those chairs all perfectly lined up waiting for people to lounge on them. Nice to be spoiled once in awhile. Looks like a beautiful place to relax. Yes, it was pretty perfect! This place looks magical and stress-free! I have never been to Mexico but would love to go with my husband one of these years. You must go! It is fabulous! This is serious luxury, wow! I’d be so happy to stay at Gran Velas Los Cabos. I’d be super excited for the spa experience and some time in the hydrotherapy lounge. Liz, this is serious luxury! Come with me next time girl! What a beautiful post! These photos look like a dream to me. I am way over due for a nice grown up vacation. It is like a dream! WOW, this place looks and sounds amazing. I don’t know that I could ever afford that for a one night stay but if I could I would want it to be here. What a gorgeous hotel! I could definitely use a pampered luxury vacation right about now! Love all of the pictures! Thanks, I love taking the photos, such a gorgeous place! This sounds like an amazing resort to stay at. I would spend he whole time in those infinity pools. Yes, they are pretty awesome! Wow, this looks like the spot to Vacation in the winter when it’s cold here! I’ll have to keep this on my travel list. A definite travel list item! That bar is now as high as the moon. WOW, what a stunning resort. I am so jealous that you were able to visit it first hand. Looks like true paradise. True paradise is right! You should book it! I must admit, I often dream of what it would be like to be rich and famous. 🙂 This place looks absolutely stunning. I can only imagine how great a time it would be. Adding this to my travel bucket list now! Absolutely this is a #bucktlist item! This looks like a fabulous resort. When we travel, we love to stay at a hotel that’s clean, comfortable and inviting. This would be a wonderful place to check out! It has all of that and more! What a beautiful hotel/resort! I have not traveled to Los Cabos yet but these photos are enough to convince me to plan for a trip there. The views are fantastic! Yes, it is awesome! Book it! Oh, wow! These pictures are gorgeous. What an amazing place to stay. The views are so pretty. I bet your stay was nice and relaxing. It was pretty close to perfect!